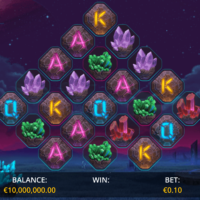 Embark on a stardust-studded intergalactic tour with Astro Legends: Lyra and Erion, the groovy new slot game from renowned, independent Estonian developer Foxium released exclusively through Microgaming’s Quickfire platform. Astro Legends follows lead character Lyra, frontwoman for a famous synthfunk band in the far-flung future, on a quest through the cosmos. Although Lyra is known for her earth-shattering solos, she has star power in more ways than one. As perhaps the last living peacekeeper from the long-abandoned planet Oratorio, it’s her secret, off-stage mission to bring positive change to every world she visits. In Astro Legends, Lyra has been lured to the surface of the trading post planet Libretto by an eccentric artificial intelligence – and big-time synthfunk fan – named Erion. With players’ help, Lyra will draw on her both her keytar chops and her ancient birth-right to break Erion’s hold on the planet’s materials and escape in time to re-join her bandmates for the gig of a galactic lifetime. The lighthearted science-fiction story of Astro Legends plays out on a gem-shaped grid, comprised of 22 crystal cells, with cluster pays that trigger when any 5 of the same symbols appear adjacently. But the simple surface hides some serious mechanical complexity. Wilds appear with randomly-chosen multipliers, respins raise the stakes, offering payouts of potentially thousands of times the total bet, and a unique bonus game sees Lyra shape-shift into her spirit form and sprint for freedom across several levels – gathering gems as she goes. After all, a popstar has to get paid! Astro Legends is also one of the first games built on Foxium’s new in-house engine, which brings its lead characters to life with high-fidelity, 3D models and outstanding animations across all desktop and mobile platforms. And the in-game action is also supported by a specially-commissioned, adaptive synthesiser soundtrack, inspired by golden-age sci-fi greats. This game is something new, and unique which we have not been able to present to the market before now and we think has all the attributes to be successful. We are here to break boundaries and challenge the industry with innovation, agility, and extensive expertise! Players can embark on an intergalactic tour with Astro Legends from Wednesday 21 November.